BARCELONA, Spain (CNN) -- Google launched the latest salvo in the cellphone wars Tuesday with the unveiling of the newest handset to carry its Android platform. Google's Android platform goes head to head with Apple's iPhone. Unveiled at the Mobile World Congress in Barcelona, Vodafone's HTC Magic smartphone will make its European bow in the UK, Spain, France and Germany in the coming months. In Italy it will be available under a non-exclusive contract. The Google-run handsets are regarded as the chief rivals to Apple's iPhones in the battle for the next generation of mobile devices. Google's latest foray into the cell phone market is seen by many as the beginnings of the Internet giant's attempts to dominate the industry. Some have expressed concerns that cell phone manufacturers, network operators and users will have little control over what data Google will be able to utilise from its software. Among critics is the LiMo Foundation, representing Linux-based operating system LiMo, which has launched its own cell phone platform, according to Congress organizer Groupe Speciale Mobile Association's daily newsletter. "A lot of operators still harbor some questions over whether they will have the control over services and how much of the data that is going out and coming from a Google device goes to Google and how much to you [the operator]," LiMo's Andrew Shikiar told Mobile Business Briefing. Users of both the Apple and Google models can download applications developed by third-parties from open-source software, potentially giving them the capability of small handheld computers. 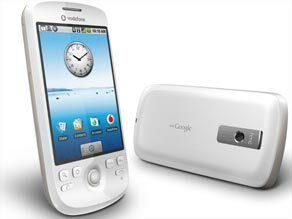 The first Android-capable handset, the G1, was launched last year. It partnered with T-Mobile for its UK launch, its first foray into the European market. Blog: Will cell phones ride the recession? The HTC Magic includes a 3.2-inch QVGA touch screen display, navigational buttons and a trackball. It also comes with several Google applications including Google Mail, Google Maps and Google Search as well as YouTube, which is owned by Google. Andy Rubin, Senior Director of Mobile Platforms at Google, said that the launch of the HTC Magic was an important step for Android. "With it, Vodafone is opening up the mobile web for consumers across Europe and giving more third-party developers a platform on which they can build the next wave of killer applications," Rubin said. CNN's Adrian Finighan, who is at the congress, said that as an iPhone user he had spent much of his time at this year's event looking for something to rival his device. "The Magic is, well, magic! I think I've found it. It really is the first device that I could consider swapping my beloved Apple device for."